A retractable roof stadium located in downtown Seattle, Washington, Safeco Field is primarily the home of Major League baseball’s Seattle Mariners of the American League West Division. The Mariners’ old home, the Kingdome, was worried to be unsuitable for a major league franchise during the early to mid-90s, as the team began its search for a new home. Public funding for the construction of a new home field for the Mariners was voted down in September of 1995 by King County voters. Soon after, the Mariners then reached their first Major League Postseason which recaptured interest from the Seattle locals to keep the Mariners in Seattle. Clearing way for the State legislature to approve alternate funding in order to find a new home for the Mariners in Seattle. 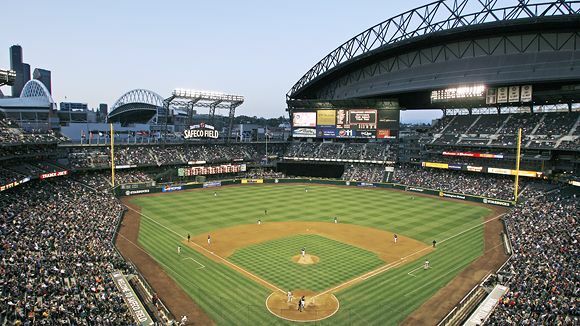 In addition to being the home of the Seattle Mariners, Safeco Field has also hosted events such as State High School Championship games and one Annual Washington Huskies game each year. • King County began exploring the options of a new stadium to house the Seattle Mariners on march 30, 1994 when they appointed Gary Locke to head the task. • In January of 1995 the group headed by Gary Locke decided that a new stadium was necessary and that a .01% sales tax raise would be enough to fund the new project. • After being voted down by local King County voters, an alternative funding plan was authorized by state legislatures on October 14, 1995. • Once coming to an agreement on the political and financial side of negotiations and funding for the project, the construction took just over two years after breaking ground on March 8, 1997 and opening the stadium on July 15, 1999.